To really scale your IoT business, your customer success and support infrastructure and processes are critical. 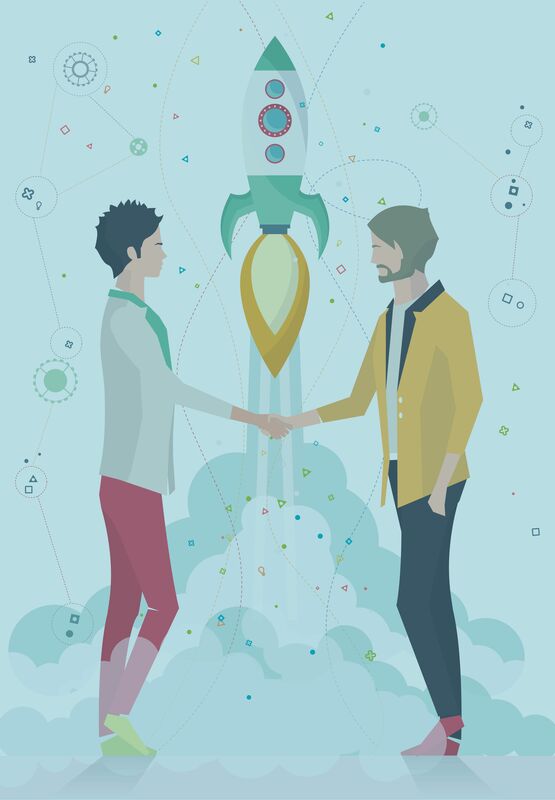 We discussed this at length in our blog post The Guide to Growing Your IoT Business Through the Customer Journey Support Model. Cost: How can I scale support cost-effectively? Does it make more sense, from a cost perspective, to insource or to outsource? Speed: How can I grow my team, infrastructure and processes really fast (especially if your company is hitting its stride in the marketplace)? 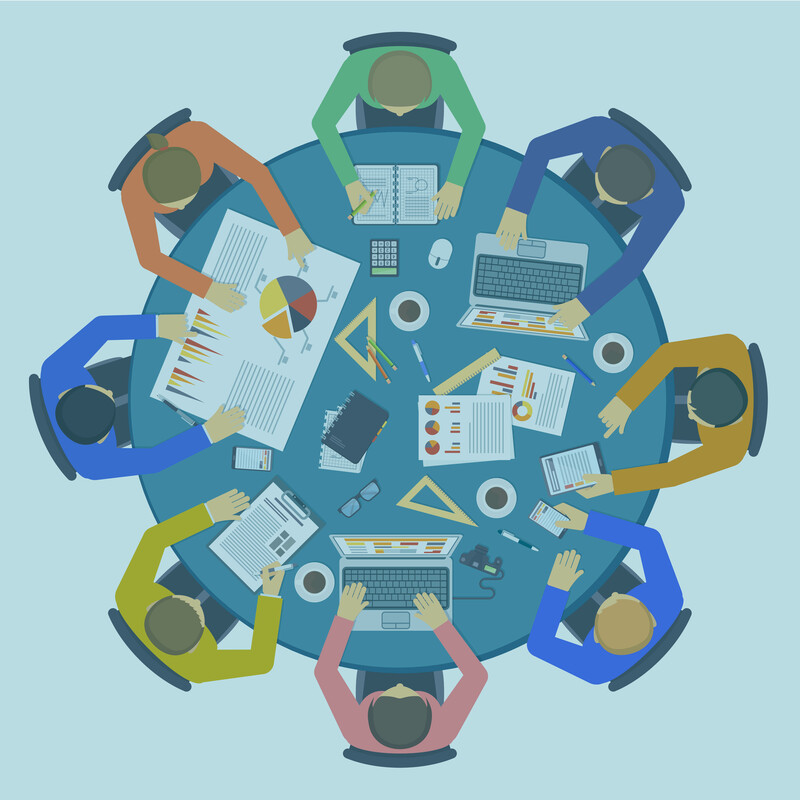 Does it make sense to hire an outsourced team, or can I do this more effectively in-house? In this article, we discuss nine considerations you should take into account when deciding whether to insource or outsource your support and other customer journey services. We put location first because we think it’s the most important point to consider. Why? Mostly because of time zones, though language is also a consideration. Having alert support personnel handle support issues on your clients’ time zones is crucial. It impacts availability, response time, language, cultural affinity and even cost. You should really consider where your main markets are or are going to be, and make support team decisions based on that. If you’re a European or Asian company, but your major market is the United States, then consider having a support team in the western hemisphere. The same goes for the opposite situation: if you’re a U.S.-based company, and your major markets are either Europe or Asia, then consider basing teams over there. That said, you can support customers in remote time zones from a central location, just make sure you account for extended or round-the-clock shifts and language issues if that’s the way you want to go. Having a well managed central location handle it all can be highly efficient too. Is your company an early stage startup, or are you starting to see explosive growth with your customer base, maybe growing by the tens, hundreds or even thousands of customers every week? If you’re early stage, you might not even have a customer success or support manager yet. It’s still probably all hands on deck, with people wearing many hats. In that case, it may be best to keep support in-house for a while. But if you’re going through a serious growth spurt or approaching one, then you need to consider outsourcing as a way to scale faster and more flexibly, especially if the pace of your internal recruitment can’t keep pace with growth or if it’s just too cost-prohibitive to grow your support team in your main location. Outsourcing is a great way to scale quickly. One word of advice we give all clients, however: you should consider outsourcing once you have a manager in place on your end, and our recommendation is not to outsource your customer success or customer support manager role. This person should always be in-house and on location, as close as possible to the rest of the startup team. It is completely feasible to have operational leaders at the remote location to support your manager with the day-to-day operations, as well as with training, workforce planning, handling escalations, managing to pre-established goals, and providing valuable customer feedback. The more sophisticated vendors will also understand the dynamics of a technology company well, and be able to provide valuable metrics and analytics to support your customer success operation. Your growth stage will determine which of those things are important and when, and help you drive the conversation with your partner to increase the value of the outsourced engagement. When you’re scaling support, you need to have in place a basic of support plays and knowledge base elements. “Plays are a set of steps that you follow to do something, decide who (or what or how) will do it, and schedule when it will be done. 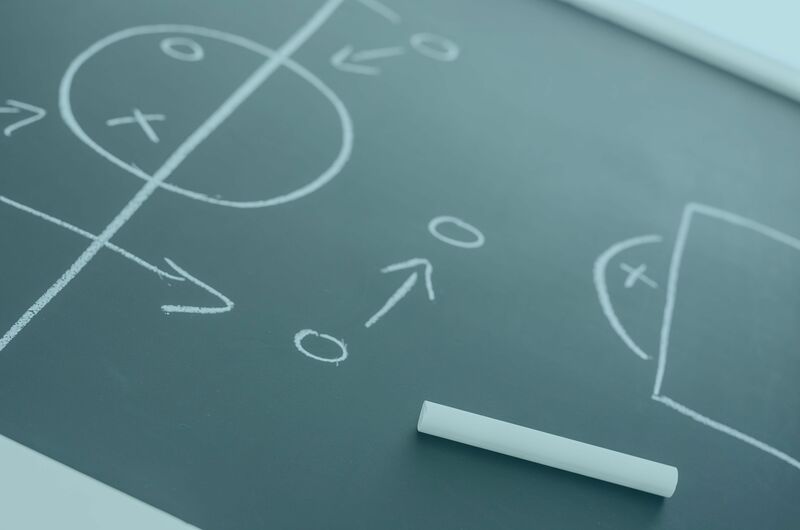 When you put together your set of support plays into a defined process, we call this a Playbook. When do you need support plays? The defining moment is usually when you hire your first customer success manager or customer support manager, as the case may be. But you definitely need to have some plays in place if you’re going to outsource any part of your customer support operation. Doing so without a clear map of what’s going to be done, by whom, how and when will complicate things, and will likely lead to micromanagement of your partner. The support play concept is fairly new and we believe it is an essential part of modern, high-quality support operation that contributes to customer retention and the growth of the bottom line. You will increase the chances of your outsourcing effort being successful if you have taken the time to figure out and document what your outsourced partner, as well as your own internal team, will do and how. You may also turn to a support partner who understands the dynamics of technology product support in the context of customer success, and who can help you develop these plays. At Infolink-exp, we work with our clients from a customer success perspective, to make sure that they have at least some level of customer journey support playbook in place that provides predictability and scalability to the operation. Whether you sell through an online store or not is another important consideration. In a consumer IoT company, your support team will likely have to do some order support, maybe handle some warranties, shipments, or handle orders directly. This may be part of the operation you need to scale. If you outsource this part of your customer’s journey or even a part of it, be prepared to make the outsourced team part of your e-commerce process, which means giving them access to your platform and the needed visibility into your ordering process. At the same time, consider putting together a play for order support escalations. In customer support, there should always be a clear escalation process. In other words, you should be clear as to what your partner does versus what you’re going to continue to do, and how escalations will work between your support and customer success team and vice versa. Usually, this will require putting together a play on what and how to escalate. Examples are a customer success manager escalating a case to support when the customer needs technical help beyond the scope of what the CSM can or should do. The reverse is also true, the person that talks to your customer about her subscription and maybe her high-level requirements for a plan upgrade, should not be the customer support technician, in which case he will need to escalate to the CSM. But these also applies to regular support ticket escalations between your L1, L2 an L3 support staff. In the absence of a clear escalation process, any support operation may turn chaotic, but this is particularly important if you plan to outsource to a remote team. You should also have a good set of tools in place. You don’t want to run customer service on Outlook. Ideally, you should have a customer service platform such as Salesforce, Desk.com, Zendesk, or any one of many other support platforms in the market. These are built for customer service, and allow you to document new issues, follow up on them even if more than one agent or support level intervenes, keep track of customer responses, generate reports and metrics, and record frequent questions and solutions for your internal or customer-facing knowledge base, among other benefits. Support tools can also enable you to provide service through multiple channels in an integrated fashion. For a consumer IoT offerings, you should probably at least be doing email, and phone, and possibly chat. Many companies we talk to don’t have those tools in place, so we offer to help them choose and set them up. The point is that these are mandatory if you hope for your operation to be scalable, especially if you are going to be relying on an outsourcing partner to achieve that scalability. You’re probably too early to think about outsourcing support if you haven’t considered, or are not yet willing to invest in the right set of tools. Related to No. 6 above, in our experience, the best outsourcing projects are those where companies focus on user success and on customer service no matter what. That means that they’re not focused on minimizing the cost of investing in licensing tools. They also don’t shortchange themselves on the size of the team required. They spend plenty of time training their representatives or agents, defining what the ideal customer experience should be, building their customer journey playbook, updating their knowledge base, and tracking the right set of metrics. The most successful companies have a clear set of goals that they want to accomplish, and they are willing to invest in the tools and processes needed to achieve them. What are your CSAT or customer experience goals? What are your productivity goals? How many calls? How many sessions? How many emails do you want per agent per hour? What are your quality goals? What are the maximum number of abandoned calls that are acceptable to you? What is your maximum average time to answer? What is the maximum resolution time? You need really clear goals. And the only way to track them is to invest in the right tools, and in the right team. The good news is that you don’t have to do it all on day 1. Support operations tend to start fairly basic and get more sophisticated with time and experience. Whether you insource or outsource though, you want to make sure that you invest enough in the elements required for a scalable operation. A big no-no in outsourcing relationships is trying to micromanage your partner. It’s counter-productive to tell people what to do at every step and sours the relationship. You hired an outsourced team for a reason. What you want to do is train them and then trust them. You want to trust your partner to actually be your partner, and trust that they have your best interest in mind. For example in our case, we do workforce management for some of our customers. We do volume projections and are able to predict what their requirements will be for team size, so we can handle those volumes. We actually do the scheduling, and real-time monitoring of resource availability to ensure the resource schedule is the best that it can be at any given hour of the day. The procedure I just described requires a high level of trust from our client. If a company insists on not letting us make adjustments on the fly, it makes it way harder for us to optimize what we do for them. Once a partner has proven it’s trustworthiness, you also want to trust them to grow your team, especially when this needs to be done quickly. Requesting a resume for every candidate is not a great way to make an outsourced operation scalable. As a segue to my next point, I would also mention trusting your partner (if they have the capabilities) to have access to the right platforms and data to help optimize what they touch, in whatever part of the customer journey that happens to be. That may mean allowing access to your e-commerce platform to process a warranty, or access to customer data (such as subscription plans or purchase history) for analyzing patterns or producing customer journey analytics. Micromanagement is not healthy in an outsourced relationship – and probably not in an in-sourced situation either- but mostly, it is not conducive to a scalable operation. Lastly, consider how a partner can help you discover corner cases and other insights. We were in a situation where we were assisting a company who had blind users. This is a classic corner case. What can we do to provide better service to these different customers in different situations? What are these corner cases? What are the most frequent issues that come up? What trends are we seeing in volumes, specific user pockets or hot issues at a given point in time (say after a product release)? Are we seeing any outliers and other things we should tackle? Data can help you with many of these issues and others. In our case, we’re proselytizing this to our customers: “Let us work with your data and we’ll be more effective in terms of what we can go back to you with”, since typically internal teams don’t have the bandwidth to do data discovery and ask enough questions. So if you decide to outsource, find a partner that can provide a feedback channel to your team, and ideally has data analytics capabilities to enable it. 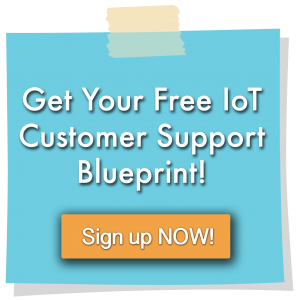 Want to know how to get started with IoT support so you can grow your business the right way? 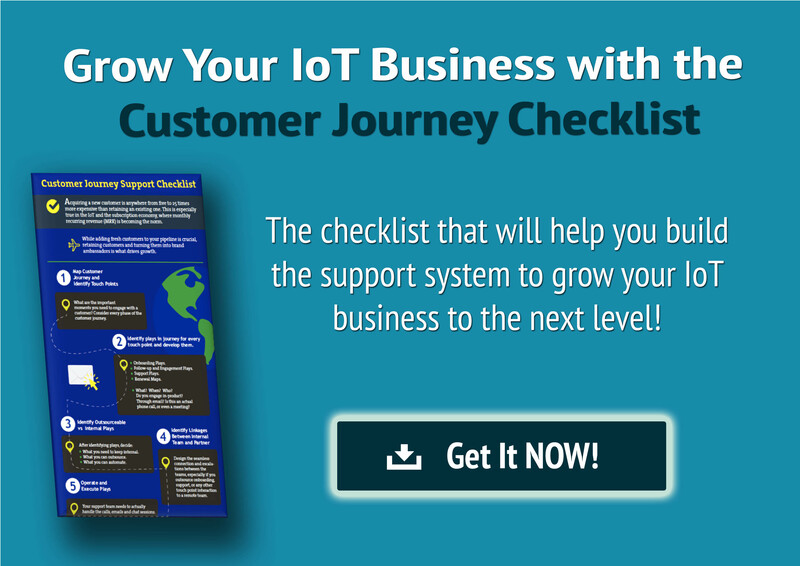 Read our complete guide on Growing Your IoT Business Through the Customer Journey Support Model.